Today February 15, 2013, an asteroid weighing 135,000 tonnes and measuring 45 meters in diameter pass close to our planet to the incredible speed of 28,000 km / h. However, we can breathe. NASA ensures that it will not collide with the Earth. Note that the meteor that hit the Urals region, north-western Russia this morning, has more than 1,000 wounded (including 200 children) according to the Russian authorities, but this natural phenomenon is not bound to the asteroid that will pass close to Earth tonight. After the meteor that hit Russia in Friday morning another celestial body came to visit us in the vicinity of our planet. Asteroid 2012 DA14 passed very close to Earth at 14 h 24 (EDT), only 27 700 miles from sol.plus near the geostationary satellites. This celestial body not yet represent any danger. There would be no link between the two events, according to scientists. 2012 DA14 is about 50 m long and has a mass estimated at 130 000 tonnes (equivalent to 3 carriers). The asteroid was found upright in Indonesia and 8,000 km below the ring formed by the artificial satellite orbit above the equator. Some of them are at 36 000 km, but the risk of collision remained almost nonexistent. The object reaches the speed of 28 000 km / hour. Even if passed very close to Earth, 2012 DA14 was not visible because of its – relative – small. In fact, it is moved to a distance of 14 times closer than the Moon as our planet. In addition, it does not reflect much sunlight. Thus, its brightness has remained lower than any star discernible without instruments. Amateur astronomers equipped with binoculars, goggles or telescopes have been able to see him in a favorable environment, away from city lights. He appeared as a moving dot as an artificial satellite. Did you know? 2012 DA14 is known for less than a year. Its discovery, La Sagra Observatory in Andalusia, Spain, dates back to February 22, 2012, during his visit to 2.6 million kilometers away. In the event that an asteroid struck the Earth size, it would create a crater of a kilometer in diameter and destroy all life in a radius of 20 kilometers. 2012 DA14 loop current its revolution around the sun with a period of 366 days. It belongs to the group of near-Earth asteroids that cross Apollos regular trajectory of the Earth and may thus represent a potential threat of collision. In June 2004, Apophis, an asteroid of about 325 m (± 15 m) in diameter and a mass of more than 45 million tons has been discovered by astronomers. In its race around the sun, asteroid directly threatens our planet a cataclysmic collision. For the first time, a NEO , so named in 2004 MNA was ranked second degree on the Torino Scale  explained Donald Yeomans, a scientist at the Jet Propulsion Laboratory of NASA in 2004. The NEO threat was discovered by R. A. Tucker, D. J. Tholen and F. Bernardi via Observatory Kitt Peak, Arizona, southwest of the United States. NASA immediately alerted its network of ground detection. 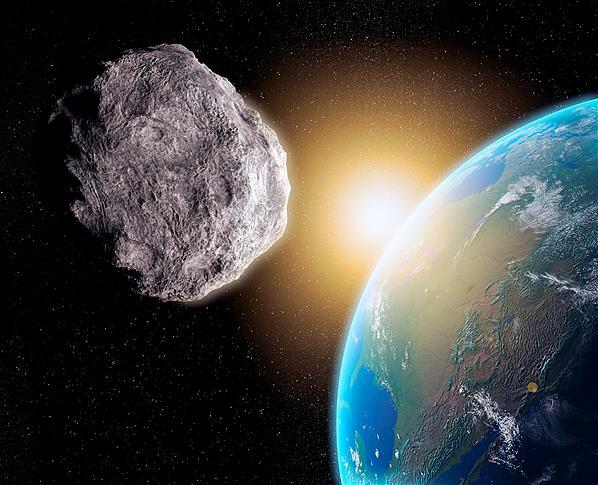 Initial estimates indicated when the asteroid that crosses Earth’s orbit twice during its revolution, could meet the Earth’s orbit in April 2029, with a collision unlikely, but not impossible. Other calculations, dated 31 October 2005, extended the maturity of a cross with the Earth in April 2036 with an assessed risk then one of 5560! This corresponds to level 1 (10) of the Torino Scale. 2004 MNA was then renamed 99942 Apophis , the name of an Egyptian deity of evil and darkness (Apep). New calculations dated May 6, 2008 dismissed a little more risk of collision. The NEO then had a « chance » to 45000 to collide with Earth April 13, 2036: the level of risk on the Torino Scale pondered 0. In fact, in April 2029 seems more worrisome because Apophis should pass only 30,000 km from the Earth! For comparison, the Moon is distant about 385,000 km from Earth. The NEO frôlerait so the Earth at a distance less than our communication satellites which are in geostationary orbit 36,000 km above the Earth. The object should be visible in the sky is cause a few scares. Fortunately, for the moment, other researchers, including experts from the Institute of Applied Astronomy of Russian Academy of Sciences, view this as unlikely collision. These estimates are bound to be refined in the coming years because the trajectory of the asteroid is subject to uncertainty  which may well prove or disprove the likelihood of impact. Indeed, « the precise determination of the orbit of Apophis is particularly difficult due to the ignorance of the » Yarkovsky effect « , named after the Russian engineer who discovered in the early twentieth century phenomenon: when a celestial body by rotation approaches the sun, it is heated on one side before cooling when turned on itself. This cooling occurs by emitting infrared radiation which creates a thrust infinitesimal but Continuing on the asteroid and thus alters the path « specifies the CNES. The Apophis asteroid came close to Earth Jan. 9, 2013 about 14,460,000 miles. An opportunity for astronomers to study its orbit and to better assess the risk of collision with the Earth. Apophis will remain observable with telescopes until February-March 2013 and will again be out of reach until 2021. Scientists, however, indicate that « in the unlikely event where it would crash well, » the meteor that is heated to over 1600 ° C entering the atmosphere, with consequential cataclysmic tsunami (tidal- tide) if he plunges into the ocean,  or massive damage on land and populated areas. Impact with Earth would release more energy of 506 megatons. It is about 34 000 times the power of the bomb dropped on Hiroshima on August 6 1945 which had then reached a power of about 15 kilotons. How to avoid the worst? If the risk of collision with the Earth fell sharply after the new details about the trajectory of 99942 Apophis, he susbiste doubt about its precise trajectory when it passes near Earth. Thus, Patrick Michel, an astrophysicist at the Observatory of Côte d’Azur showed  that only 600 meters, Apophis could crash into Earth or continue its course in space during its passage 32000 km from the Earth in 2036. This gap will depend on the Earth gravitational perturbations it is, for the moment, not possible to determine. This is why scientists have insisted that discussions be engaged on ways to avoid disaster or regional warming. Thus, a working group of experts from several countries prepared a draft international treaty to be submitted to the UN in 2009. Already, examines CNES space mission designed to determine the internal structure of the asteroid and allow to change the trajectory of the NEO, if it should become really threatening. Some asteroids like Apophis, regularly pass near the Earth. And so the chances of one of them hitting our planet are almost nil, scientists think actively ways to neutralize these cars space and avoid disaster. Consider ways to deflect the trajectory of the NEO is not in vain because odds are that others will be discovered asteroids threatening the meantime. Also known as Apep the Destroyer, Apophis is the Egyptian god of evil and destruction who lived in eternal darkness. Apophis can see its trajectory altered by gravitational perturbations caused by other solar system bodies. The Earth-Moon distance is about 384 403 km on average.